As part of my journey through Southeast Asia, I was really excited at the idea of seeing the new Marina Bay Sands in Singapore and the view was as stunning as I expected. The three huge towers, with the deck shaped like a boat resting on the top, look like a contemporary and creative interpretation of Stonehenge prehistoric monument. The Sands Sky Park on the rooftop offers a beautiful 360 degrees view of Singapore and hosts the 150 meters long infinity pool overlooking the skyline, plus the exclusive executive lounge, both open only to Hotel’s guests. Visitors can however buy tickets to visit the observation deck (keep in mind that only a limited amount of people are allowed at the same time, so better book your tickets in advance), take one of the guided tours (3 every day, at 10 a.m., 2 p.m. and 9 p.m.) or simply enjoy the view of the skyline at sunset, sipping a drink at the Ku De Ta bar. 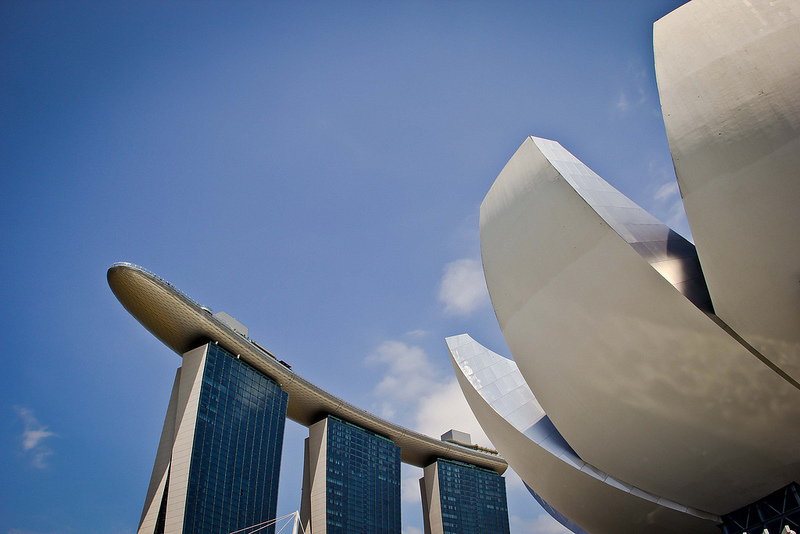 A great way to admire every angle of Singapore Marina Bay Sands is taking a tour of the bay by boat, drifting slowly in one of the most unusual skylines in the world. Note: Special thanks to Bhavna Moolani of Marina Bay Sands for the warm welcome and the privilege of a special guided tour of the Sands Sky Park. Excellent photography, great blog posts. great shot! u always have such and excellent eye, simon!